How to make users reflect about their practice? Games are generally based on interactions and stimulations. But these aspects don’t sustain the distance required to reflect on their practice. Propose an analysis of actions during calm phases. Debriefings are important steps of tutoring systems [Mayer, 2004] [Kirschner 2006]. Why did it happens ? How to improve performances ? We can distinguish passive debriefings, where the system just displays an analysis, from active ones where the user interacts with the system to understand. For example, in Starbank, at the end of each completed levels, the system displays a summary listing the right actions which have been done by the users (passive debriefings). In SASO–ST, a military Serious Game to learn negotiation, action phases are made of dialogues where the user chooses answers. 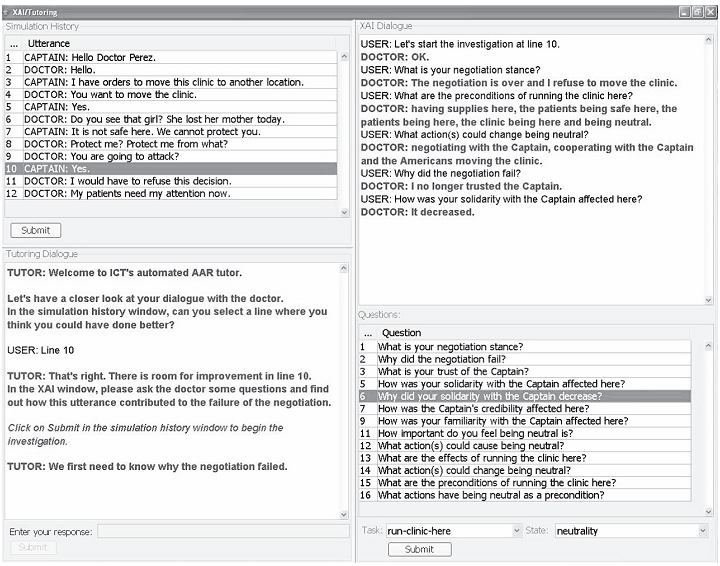 A debriefing presents the played dialogue and asks to the user to point her errors (see picture). Coming back to these steps, the user can ask to the other characters to explain his behaviour. 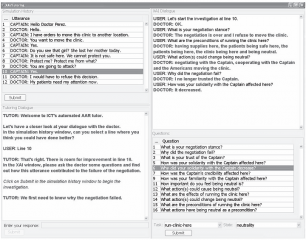 Finally the user can replay this part of the dialogue scene, choosing other sentences (active debriefings). In order not to discourage users, it could be helpful to make a « feedback sandwich » including the analysis of an error between the analysises of two right behaviours (see literature). Core, M.G.,Traum, D.,Lane, H.C.,Swartout, W.,Marsella, S.,Gratch, J., & van Lent, M. (2006). Teaching Negotiation Skills through Practice and Reflection with Virtual Humans. In C.M. Overstreet & A. Martens (Eds. ), SIMULATION : Transactions of the Society for Modeling and Simulation International, Special Issue on Modeling and Simulation in Teaching and Training,82(11), 685-701. * Mayer,R. 2004. Should there be a three-strikes rule against pure discovery learning ? The case for guided methods of instruction. American Psychologist 59(1):14–19. * Kirschner, P.A., Sweller, J., Clark, R.E. 2006. Why minimal guidance during instruction does not work : Ananalysis of the failure of constructivist, discovery, problem-based, experiential, and inquiry-based teaching. Educational Psychologist 41(2):75–86.